From the bus windows we suddenly catch a glimpse of something few of us imagined we’d see in the Holy Land: A snow-capped mountain with a ski resort! We’re looking at Mount Hermon, a volcano-shaped summit looming more than nine thousand feet high on the extreme northern end of Israel, right on its border with Syria. In the morning you could ski on one of the fourteen runs at the resort here, then hop in your car and by lunchtime be in the middle of the desert sliding down sand dunes — and then after another short drive you could be surfing while the sun sets over the ocean! Not exactly the vacation most people imagine in Israel! It may have been on this mountain that Jesus was transfigured before three of his disciples (the event is usually called “the Transfiguration”). Although there is a different, traditional site for the transfiguration closer to Galilee, I think this mountain more closely fits the gospel descriptions of a high, remote place near Caesarea Philippi. What happens here is pure poetry. I don’t mean to say the transfiguration is only poetry, that it didn’t actually happen; I’m convinced it did. But once again, God shows himself to be an artist, as the sight the disciples experience here is literally a revelation — it reveals, makes clear, in visual terms, what Jesus is all about. Can you perceive the poetry? Listen first to the echoes from other mountains. About 1,400 years before Christ, the Bible says God showed his glory to Moses in a cloud referred to as the “shekinah glory.” The shekinah was the shining, unfiltered glory of the Holy One. But it was too intense, too pure, for humans to bear. Even Moses was told to hide in a cave as the shekinah passed nearby. “No one can see my face and live,” God tells him. The shekinah makes a reappearance in the tabernacle, which was sort of a temporary temple, hovering over the ark of the covenant. Here (and later in the temple) the high priest atoned for the sins of the people of Israel behind a thick veil of separation, a curtain separating the Holy of Holies from the rest of the world. This curtain was a visible reminder that the shekinah could not dwell with sinful man. Only the high priest can be near God’s shekinah, and only when making atonement for sin. Moses’ mountaintop experience teaches us that God is holy. And the people were afraid. Several centuries after Sinai, Elijah has his famous showdown with the priests of Baal. He challenges them to something like a god-contest. They build an altar to Baal, Elijah builds an altar to Yahweh, and a crowd gathers to see which one will accept the sacrifice. The Baal priests pray and get no answer. Then Elijah prays and the mountain is lit up as with lightning — fire comes down from heaven — Elijah’s sacrifice is consumed in a bright instant, proving God’s existence and might. Elijah’s mountaintop experience teaches us that God is powerful. And the people were afraid. Fast-forward several centuries more. We’re on a mountain again. There’s Moses again. There’s Elijah again. And it’s as bright as lightning again. As I squint at Mount Hermon’s snow-capped slopes, it’s easy to picture the white light the gospels describe. Ever leave a dimly lit cabin to emerge in the brightness of a snow-covered landscape at midday? The brightness actually has power. The disciples had been seeing through a glass, darkly. Now they see reality unobscured, for just an instant. Their eyes hurt in the brightness. Mark says the light was so intense that it made Jesus’ clothes appear whiter than anything on earth. But this time there’s a twist. The glory comes from Jesus. The shekinah is not shining from above, onto him. It’s shining from inside him. Jesus doesn’t behold the glory of God. He is the glory of God. Peter was appropriately overwhelmed with awe and terror at the shekinah. So he responds the way humans have responded in all their religions for thousands of years: Let’s build a tabernacle, a temple, a system for mediating this achingly vast distance between God’s glorious brightness and man’s sinful darkness. He doesn’t just want to house Jesus, Moses, and Elijah. He wants to shield himself from the brightness. He is afraid of the light. So his solution is religion. The cloud lifts. And Moses and Elijah are gone. The two great divisions of the Hebrew Scriptures were called the Law and the Prophets. Moses represented the Law, and Elijah the Prophets. They both endorse Jesus. And then they leave. The Law and Prophets are no longer needed as a protective mediator between God and people. Because something new is here. Law and Prophets, meet Gospel. The very shekinah of God is now with humans. God with us. Jesus is the ultimate priest to end all priests, the prophet of all prophets. Maybe you’ve been afraid of God. Maybe you’ve been so aware of the difference between your dingy darkness and God’s beautiful brightness that you’ve almost given up — if there is a God, how could you ever approach him? All your religion has done is remind you of the distance. The point of Christ is, he bridges that gap. He touches you. And he sends fear fleeing. 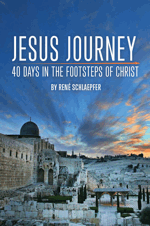 At the mountain, Peter, James, and John get an inspiring preview of what Jesus will do when his mission as Messiah nears completion. He will not always be the Lamb. One day he will return as the Lion. And they get a glimpse of this glory. When he’s an old man, John sees Jesus again in a vision. And it’s this transfigured Christ. And look at what Jesus says to John. Again. The shekinah glory of God appears again. And God speaks. And says the thing he always has to say, because no one is ever ready for him to show up. Fear not. Thank God today for the truth that Jesus is the exact representation of God — that he is the glory of God. Pray that you will grow in your understanding of this truth and be comforted by the power and peace of God in Jesus Christ.